The price of the Yuneec Breeze has been falling fast. First listed 18 months ago at an inflated price of $499, the Yuneec Breeze can now be found at retailers like Amazon for less than $200. Thanks largely to competition from Yuneec’s fast-moving competitor DJI, the price of the Breeze is now finally in line with its capabilities. This left us wondering, is the Breeze the best camera in the sky for less than $200? We had to buy one to find out. Specs – How Does it Compare? Let’s just get right to it, the Breeze just doesn’t compare favorably to a gimbal-stabilized camera drone like the DJI Spark. That said, the Spark costs about twice as much, so if you are looking to save some money, the Breeze might be a good choice. 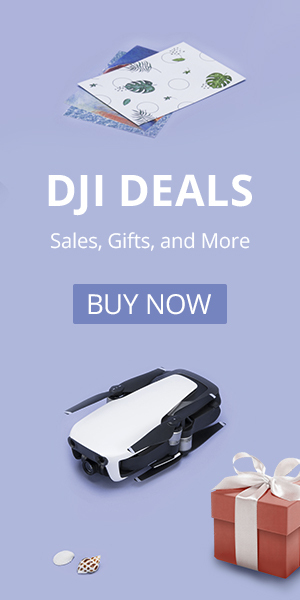 Take a look at the DJI Spark and our Tello. The Yuneec Breeze sports a 13 Megapixel 4K camera with a smartphone-sized 1/3-inch image sensor. We were happy to see that the camera and its one-axis gimbal are suspended on a nice soft suspension to help reduce camera shake and the “jello” effect. The gimbal on the Breeze allows you to angle the camera down. It is controlled by what sounds like a servo motor, not a brushless motor like the Spark. This means that the motion is not intended to be used for smooth transitions or for stabilization, the motor is just there to allow you to angle the camera down. This gives it less capability than the Spark but more than the Tello, which has a fixed-angle camera. The camera on the Breeze can’t look up so fast forward flight will have you looking down. The image quality from the Breeze is good but not great. The quality is somewhat limited by the fact that the Breeze, like the Tello, relies on digital image stabilization rather than a gimbal. Both drones still out-perform their sub-$200 peers, so we are not complaining. We think the Breeze is the best camera in the sky for less than $200. The stability of the video is much better than a non-stabilized video but it is by no means fully stable. In 4K recording, you get no stabilization while in lower resolution 1080p you get pretty good stabilization as long as you don’t fly too fast. The Yuneec Breeze was really designed to be a drone flown by a Smarphone. If you want to fly this way then it really is a “Breeze” to set up (I couldn’t help myself). The flight modes are all there in the app and everything was intuitive to use. Our Breeze came with a Yuneec-branded Game Sir G3 remote, which you can also buy separately from Amazon for about $30. We learned, somewhat painfully, that you need to pair the drone to your smartphone before you try and pair the Game Sir to your remote. Despite the fact that the Game Sir is marketed as a remote for Android, it worked well with my iPhone and other users report the same experience. Both the remote and the drone connect to your smartphone. The other problem in flying with the remote is that there seems to be no way to angle the camera down. What the?!?! This is a major oversight and after almost two years there is no reason we can think of why this has not been resolved. I have to admit that we were shocked by the stability of this drone. I took it out in very high winds and I was half expecting the Breeze to be carried away in the breeze (there I go again). The ability of its tiny props to power through the wind amazed us. The optical flow camera sensor and IR sensor on the bottom of the Breeze make it incredibly stable even in high wind. The GPS paired with the downward-facing sensors were rock solid as the Yuneec held position extremely well, just like more expensive drones like the Spark, Mavic Air, and Phantom 4 Pro. The props on the Breeze look small and too thin compared to the size of the drone so the Breeze surprised us with its stability in high wind. The Breeze is powered by four brushless motors, which is pretty much a requirement on a high-performing drone this size. Brushless motors provide more efficiency and power, which sets this quadcopter apart from the smaller Tello. The $99 Tello is powered by small brushed motors. The Yuneec Breeze comes with everything you need and not much else. The remote includes a nice phone mount, which is a must-have to fly this way. You also get one battery, one set of extra props, a case, and some prop guards. Not shown in the picture below are the instruction manuals, which are pretty good and easy to follow. You can pick up some goggles like Google Cardboard if you want to fly with goggles, they will set you back as little as $10. You get one battery and a carrying case with your purchase. Some packages include a Game Sir remote. The Breeze’s case looks nice on the outside but is awkward and cheap-looking on the inside. At around $200 this drone is a great deal. It takes 13 MP pictures (better than the Tello’s 5 MP) and can record in 1080 with electronic stabilization running (better than the Tello’s 720). Unlike the Tello, the footage recorded by the Breeze is recorded on the drone – so you won’t ever lose quality due to a glitchy connection. 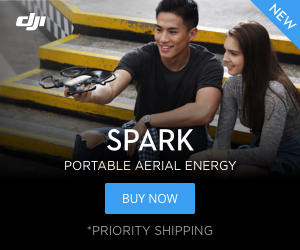 If you are looking for primo quality drone and you can fork over about $400 then the Spark is definitely the way to go. Which drone you go with depends on how much money you have to spend, they are all priced really well at this point, and we stand by all three of them. Buy on Amazon, a great deal!